Professor Wyllie's main interest is in the processes associated with magmatic phenomena, starting with mantle convection or flux of volatiles in the mantle that initiates partial melting, continuing through the migration and emplacement of igneous bodies in mantle or crust, and culminating in volcanic eruptions. The experimental determination of phase relationships at high pressures and temperatures for complex rock systems and for related simple synthetic systems places constraints on the processes involved in the origin of rocks, and supplements other approaches of geochemistry, geophysics and fluid dynamics. Research topics have included the origin of granitic, batholiths, andesites, kimberlites, carbonatites, and associated ore deposits, evaluated from the phase relationships of minerals and rocks at high pressures and temperatures. Results from two recent projects are outlined in the Research Report, with current references (April 1999). 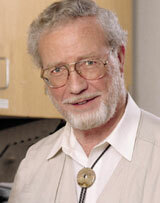 Professor Wyllie is President, IUGG International Union of Geodesy and Geophysics, 1995-1999. President, IUGG International Union of Geodesy and Geophysics, 1995-1999.